The goal of this text is to focus readers attention on three major areas; the origin and localization of GSH in the nervous system; the multiple effects of GSH on neural health activity; and the potential for alterations on GSH status to lead to neurological damage of the type observed in amyotrophic lateral sclerosis, Parkinson's disease and other neurological disorders. The text also touches upon the additional roles of the antoxidant GSH, including possible neurotransmitter action, redox modulation of ionotropic receptor function, and neuroprotection against exicitoxic actions of glutamate. 1. 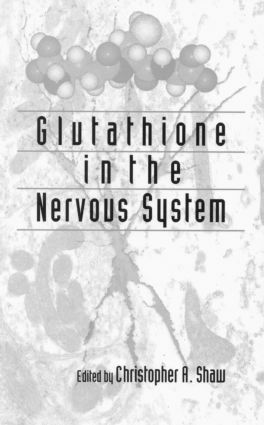 Multiple Roles of Glutathione in the Nervous System Christopher Shaw 2. The Discovery of the GSH Receptor in Hydra and its Evolutionary Significance Howard Lenhoff 3. Carrier-Mediated GSH Transport at the Blood-Brain Barrier and Molecular Characterisation of Novel Brain GSH Transporters Ram Kannan, Jian-R. Yi, Berislav Zlokovic and Neil Kaplowitz 4. Antibodies to Glutathione: Production, Characterisation, and Immunocytochemical application to the Central Nervous System Ole Hjelle, E. Rinvik, D. Huster, W. Reichelt and Ole Ottersen 5. Role of Astrocytes in Maintaining Cerebral Glutathione Homeostasis and in Protecting the Brain Against Xenobiotics and Oxidative Stress Arthur Cooper 6. Glutathione and the Regulation of Apoptosis in the Nervous System Khalequz Zaman and Rajiv Ratan 7. Possible Modulation by Glutathione of Glutamatergic Neurotransmission Kiyokazu Ogita, Makato Shuto, Hiriko Maeda, Takao Minami and Yukio Yoneda 8. Glutathione and Glutathione Derivatives: Possible Modulators of Ionotropic Glutamate Receptors Reka Janaky, Vince Varga, Zsolt Jenei, Pirjo Saransaari and Simo Oja 9. Excitatory Actions of GSH on Neocortex Bryce Pasqualotto, Kenneth Curry and Christopher Shaw 10. Medicinal Chemistry of Glutathione and Glutathione Analogs in the Mammalian Central Nervous System Kenneth Curry 11. Glutathione in Brain Ageing and Neurodegenerative Disorders Gianni Benzi and Antonio Moretti 12. The Glutathione Redox State and Zinc Mobilisation from Metallothionein and other Proteins with Zinc-Sulphur Co-ordination Sites Wolfgang Maret 13. Glutathione Release and Nitrosoglutathione Presence in the CNS: Implications for Schizophrenia Michel Cuenod and Kim Quang Do 14. The Role of Altered Glutathione Status in the Development of Parkinson's Disease J. Sian, M. Gerlach and P. Riederer 15. Glutathione, Cysteine, and the Neuromelanin Pathway: Potential Roles in the Pathogenesis of Parkinson's Disease - a New Hypothesis Glenn Dryhurst 16. Free-Radical Toxicity in Amyotrophic Lateral Sclerosis Merit Cudkowicz, Robert Brown and Richard Smith 17. Oxidative Stress and Neurological Diseases: Is Glutathione Depletion a Common Factor? Jaswinder Bains and Christopher Shaw. Gianni Benzi, University of Pavia, Italy, Robert Brown, Massachusetts General Hospital, USA, Arthur Cooper, Cornell University Medical College, Merit Cudkowicz, Massachusetts General Hospital, USA, Michel Cuenod, University of Zurich, Switzerland, Kenneth Curry, Precision Biochemicals Inc., Canada, Kim Quang Do, University of Zurich, Switzerland, Glenn Dryhurst, University of Oklahoma, USA, M. Gerlach, University of Bochum, Germany, Ole Hjelle, University of Oslo, Norway, D. Huster, University of Leipzig, Germany, Reka Janaky, University of Tampere Medical School, Finland, Zsolt Jenei, University of Tampere Medical School, Finland, Ram Kannan, USC School of Medicine, USA, Neil Kaplowitz, USC School of Medicine, USA, Howard Lenhoff, University of California, USA, Hiroko Maeda, Setsunan University, Japan, Wolfgang Maret, Harvard Medical School, USA, Takao Minami, Setsunan University, Japan, Antonio Moretti, University of Pavia, Italy, Kiyokazu Ogita, Setsunan University, Japan, Simo Oja, University of Tampere Medical School, Finland, Ole Ottersen, University of Oslo, Norway, Bryce Pasqualotto, University of British Columbia, Canada, Rajiv Ratan, Harvard Institutes of Medicine, USA, W. Reichelt, University of Leipzig, Germany, P. Reiderer, University of Wurzburg, Germany, E. Rinvik, University of Oslo, Norway, Pirjo Saransaari, University of Tampere Medical School, Finland, Christopher Shaw, University of British Columbia, Canada, Makoto Shuto, Setsunan University, Japan, J. Sian, University of Wurzburg, Germany, Richard Smith, The Centre for Neurologic Study, USA, Vince Varga, University of Tampere Medical School, Finland, Jian-R. Yi, USC School of Medicine, USA, Yukio Yoneda, Setsunan University, Japan, Khalequz Zaman, Harvard Institutes of Medicine, USA, Berislav Zlokovic, USC School of Medicine, USA.